When you picture Sable Island, idyllic scenes comes to mind: sandy dunes, windswept beaches, and untamed horses. It's a romantic image, and one that a group of Halifax students hopes to protect. To discourage Sable's wild horses from trotting near human infrastructure, the students created a deterrent system that uses motion sensors and high-frequency sounds to limit the animals' exposure to human waste, plastic materials and human interaction. The device will also collect data so the horses can be monitored over time. The students, who are in Grades 7 or 9, worked on the project as part of an innovative university-community program called Imhotep’s Legacy Academy. The program helps connect university and college mentors from Dalhousie University in STEM (science, technology, engineering and mathematics) subjects with Nova Scotian students of African heritage (although it's not a requirement for participation). 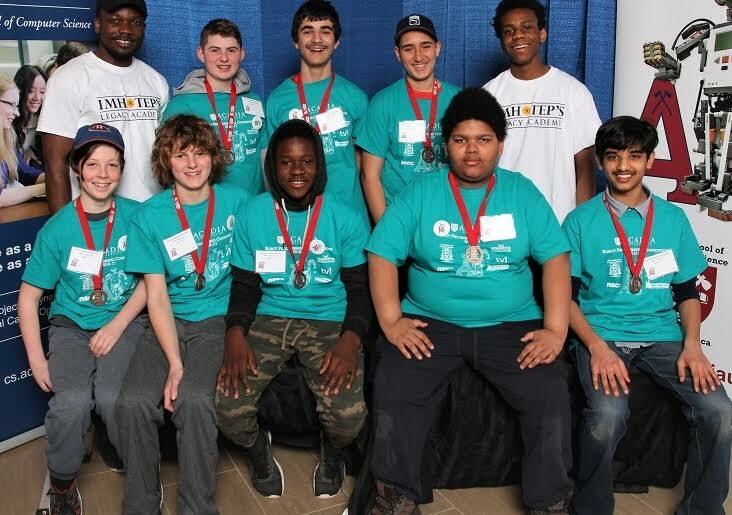 “The [Sable Island] project was designed by the children when they had to think of an issue to solve using technology and engineering for a contest that runs out of Oxford Junior High,” says Imhotep program manager John Aruagha-Ndukwe. Now, the team is taking their design to the world stage. The students advanced to the FIRST Global Innovation Awards competition–where they will have a shot at the $20,000 first prize–after having qualified in the Nova Scotia Community College robotic design competition last fall. After that competition, the students won awards at the Acadia University and decided to submit a synopsis of their project for the international science and technology competition, being held June 18 to 20 in Washington, D.C. The team, “Legos R Us,” from Oxford Junior High School are one of three Canadian teams set to compete in Washington. Aruagha-Ndukwe says the growth of the students from working on the project is massive. Imhotep's Legacy Academy's FIRST Lego League team, "Legos R Us," are from the Oxford Junior High School in Nova Scotia. The team is one of 20 global finalists in the Washington’s FIRST Global Innovation Awards competition (Photo: Imhotep’s Legacy Academy). One of the team members, Evan Rossiter, says he is excited to go compete in Washington and hopes to place in the finals. The group has successfully raised $16, 000 online, which will help to send all nine kids and their chaperones. Aruagha-Ndukwe says the kids are ecstatic to be able to travel out to Washington for the competition. The winning team at the competition will receive $20, 000, with second and third place receiving $5,000.